Recent writers on negligence and culpable ignorance have argued that there are two kinds of culpable ignorance: tracing cases, in which the agent’s ignorance traces back to some culpable act or omission of hers in the past that led to the current act, which therefore arguably inherits the culpability of that earlier failure; and non-tracing cases, in which there is no such earlier failure, so the agent’s current state of ignorance must be culpable in its own right. 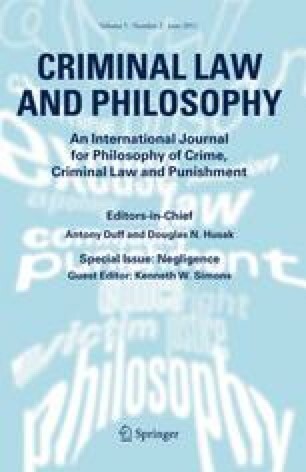 An unusual but intriguing justification for blaming agents in non-tracing cases is provided by Attributionism, which holds that we are as blameworthy for our non-voluntary emotional reactions, spontaneous attitudes, and the ensuing patterns of awareness as we are for our voluntary actions. The Attributionist explanation for why some non-tracing cases involve culpability is an appealing one, even though it has limited scope. After providing a deeper account of why we should take the Attributionist position seriously, I use recent psychological research to argue for a new account of the conditions under which agents are culpable for straightforward instances of blameworthy acts. That account is extended to blameworthiness for non-voluntary responses. I conclude that even when the agent’s failure to notice arises from a nonvoluntary objectionable attitude, very few such cases are ones in which Attributionism implies that the agent is blameworthy for her act. For comments on earlier versions of this paper I am grateful to Alvin Goldman, Karen Shanton, discussants at Union College, and especially Douglas Husak and Kenneth Simons. Carey, B. (2010, July 5). The benefits of blowing your top. The New York Times. http://www.nytimes.com/2010/07/06/health/06mind.html?ref=benedict_carey. Accessed 12 November 2010. Liberman P. & Pizarro, D. (2010, October 24). All politics is olfactory. The New York Times Online http://www.nytimes.com/2010/10/24/opinion/24pizarro.html?scp=1&sq=All%20politics%20is%20olfactory&st=Search. Accessed November 12, 2010. Smith, H. (2011, February) The ‘Prospective View’ of obligation. Journal of Ethics and Social Philosophy. http://www.jesp.org. Weingarten, G. (2009, March 8). Fatal distraction: Forgetting a child in the backseat of a car is a horrifying mistake. Is it a crime? Washington Post. http://www.washingtonpost.com/wp-dyn/content/article/2009/02/27/AR2009022701549.html. Accessed November 12, 1020.